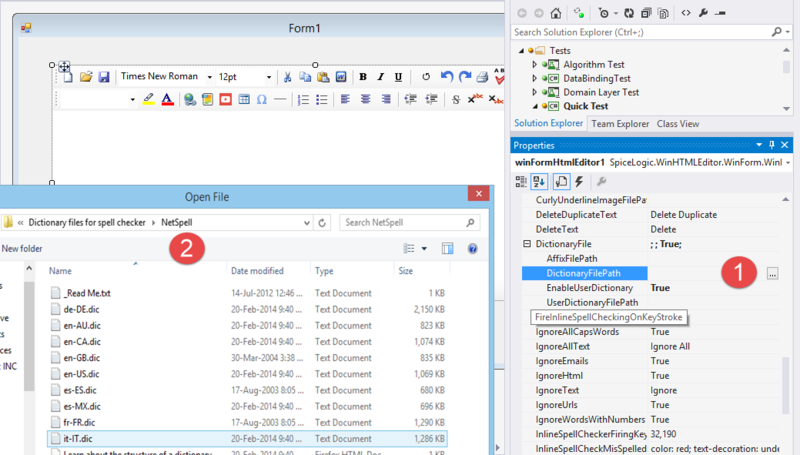 By default, the editor uses NetSpell Dictionary engine. 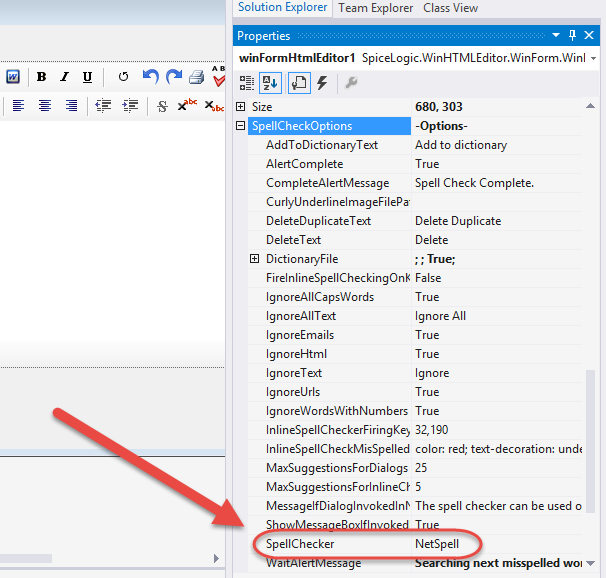 You can change the engine from the SpellChecker property as shown in the following screenshot. So, if you do not change the SpellChecker property, then you can use any NetSpell compliant Dictionary File. Please note that, if you want to use US English Dictionary, then you do not need to set any Dictionary file path. Because US English Dictionary is already Embedded and used by default. In order to set a dictionary file, simply set the DictionaryFilePath property (found under the SpellCheckerOptions) with the full path where your dictionary file is located. If you set a dictionary file, then, the default built-in US-English dictionary file will not be in effect. If you do not set any dictionary file, then, the US-English dictionary file will be used from it's embedded resource. Where to find dictionary files for various languages? We have provided some common dictionary files in the Trial Version package you have downloaded from our website. You can search on the internet for a NetSpell compliant dictionary file of your proffered language. The NetSpell source code is embedded into our editor, it is tested and it works fine. But, you may not find lots of updated dictionary files for NetSpell because the project is abandoned. Therefore, you may consider using NHunspell SpellChecker Engine. This control supports NHunspell compliant (Open Office) dictionaries and you will find lots of Open Office dictionary files for various languages.